Acura sure throws around a lot of big, important words when it comes to the RLX, their flagship. Words like “uncompromising”, “most progressive”, “most extraordinary” and “like nothing you’ve ever driven”. So – is it all those things? Yes, you’re reading that correctly. 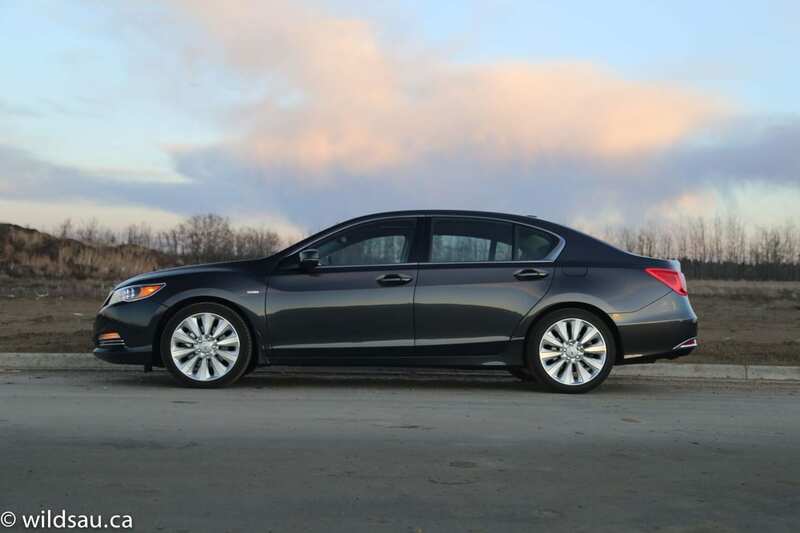 The 2015 Sport Hybrid RLX is over $72,000 before taxes. Ouch. Well, let’s get to the big news. It’s under the hood, or more importantly, under the sheet metal (not just the hood) where this particular RLX stands out from the crowd. The Sport Hybrid is a gas/electric hybrid, but unlike what you’ll find in a Toyota, Lexus or most other common hybrid applications. 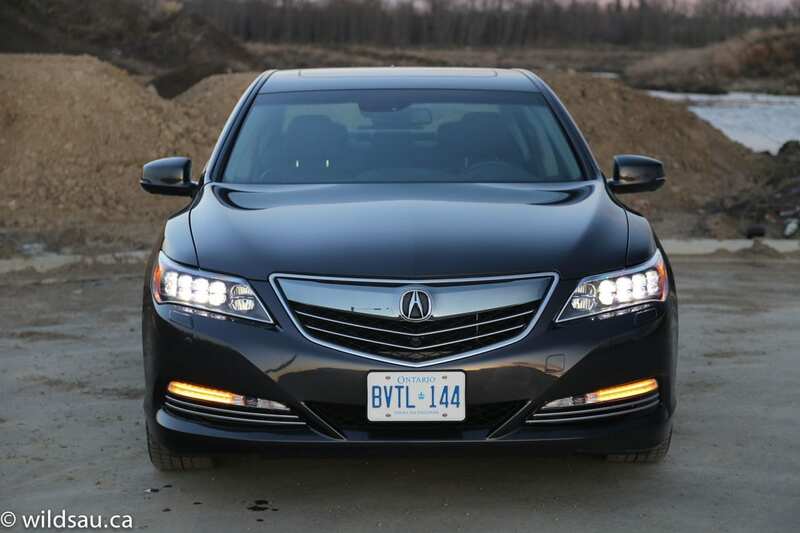 There’s a 3.5-litre V6 which puts out nearly identical numbers to the gas-only RLX – 310 horsepower at 6500 RPM and 273 lb.ft of torque at 4700 RPM. Here’s where it gets interesting. Acura actually uses three electric motors in this hybrid. There’s the front one you’d expect, augmenting the gas engine as per usual. But there are two more. Two twin independent electric motors can be found at the back – one for each rear wheel. Together, the system cranks out 377 horsepower and 341 lb.ft of torque. Those figures are nothing to sneeze at. 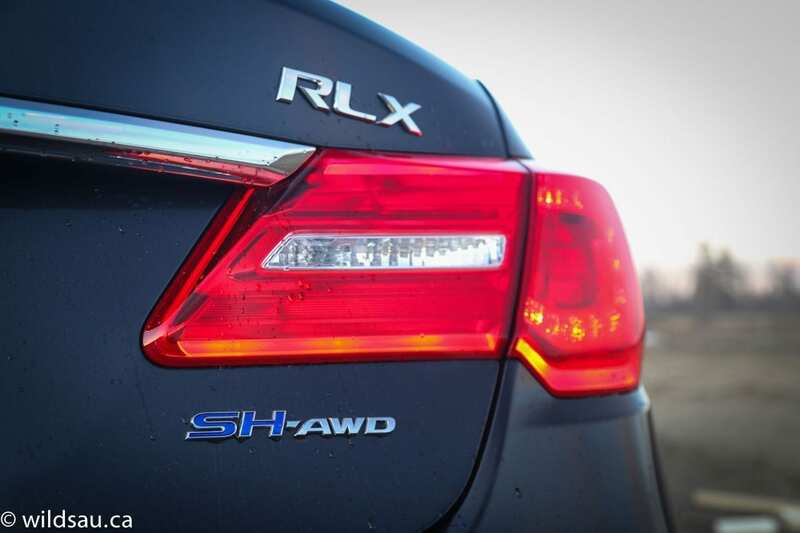 The rear electric motors make the RLX Sport Hybrid an all-wheel drive, and while it’s not the amazing mechanical Super Handling All-Wheel Drive (SH-AWD) we’ve come to know from Acura, it apparently still qualifies as they have tacked on the SH-AWD acronym here. 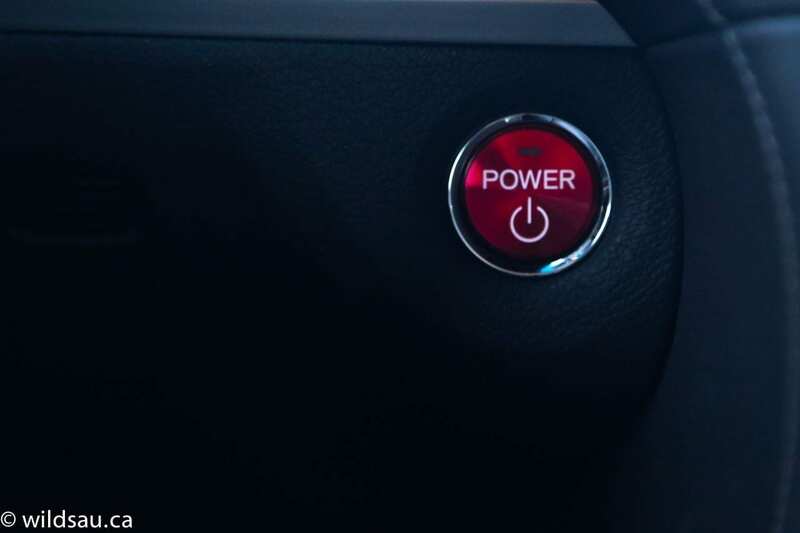 Power from the front is routed through a 7-speed dual-clutch automatic. Obviously, with that kind of power, ultimate fuel economy isn’t the goal. 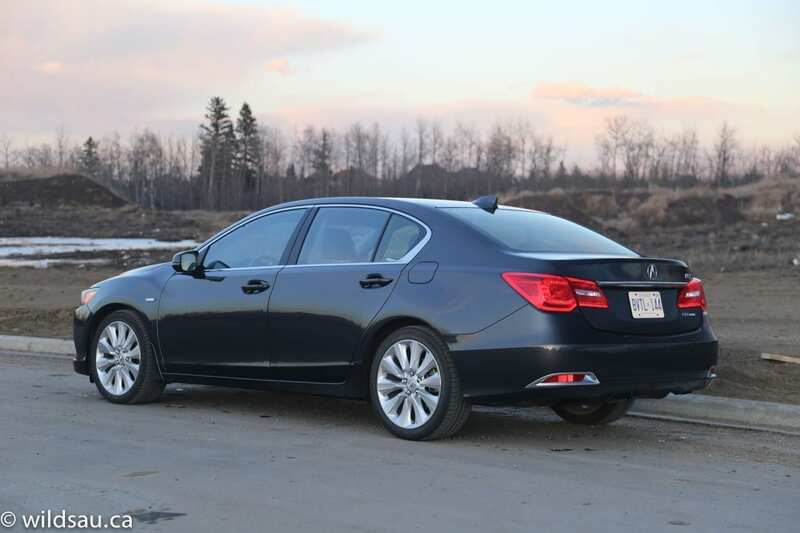 Rather, the RLX Sport Hybrid sets out to perform incredibly well and to use surprisingly little fuel while doing so. It’s rated at an impressive 8.0 L/100 km (29 US mpg) in the city and 7.5 L/100 km (31 US mpg) on the highway. Walking around the RLX, you’ll note that it definitely does not stand out from the crowd when it comes to the sheet metal itself. I’ve previously described it as simple, plain and a bit uninspired. And I’ll stick to that. It is a nice-looking car, to be sure. 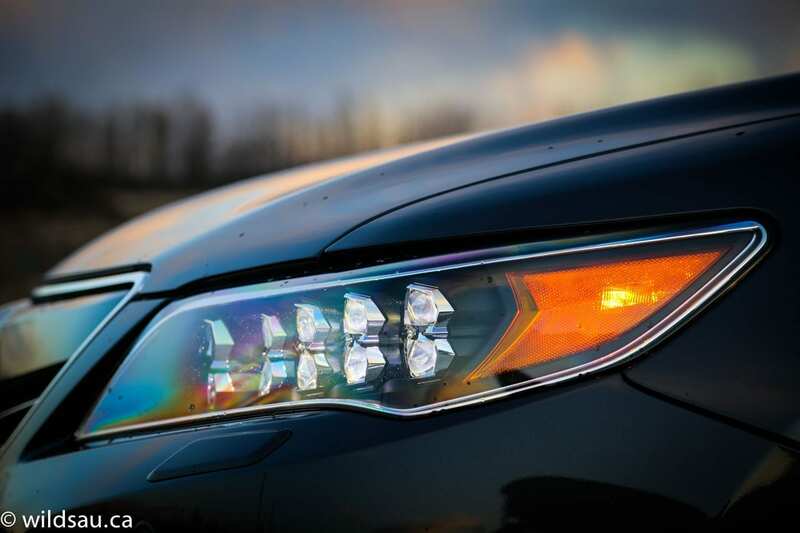 Modern details abound, such as the guaranteed-to-get-a-second-look Jewel Eye LED head lights, LED fog lights and nifty LED-strip tail lights. 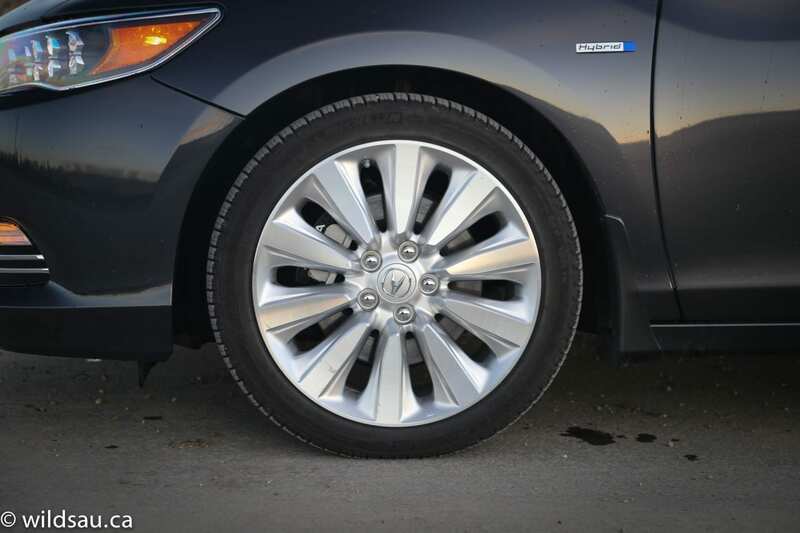 Fenders are nicely filled with huge 245/40-sized boots wrapped around handsome 19-inch rims. But all the pretty details can’t change the fact that the RLX remains a yawn-fest and it’s not much to look at. There’s simply nothing to get excited about. You want luxury? There’s no shortage of it. 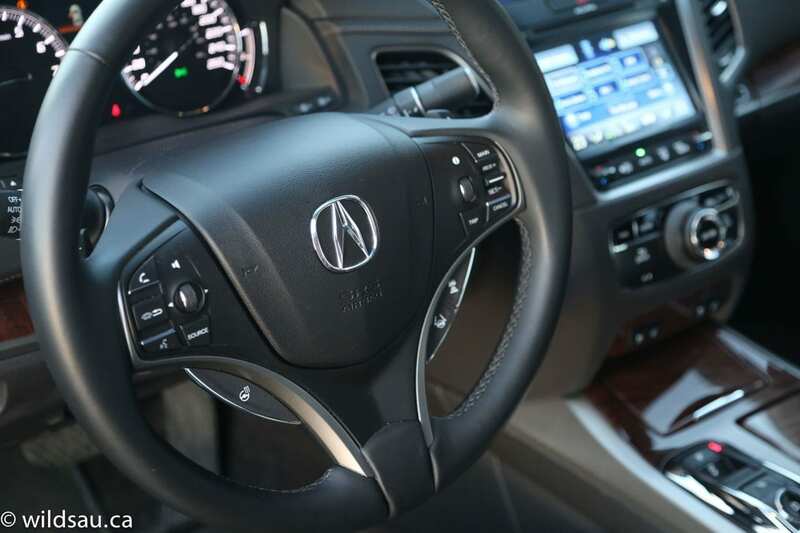 The RLX’s tastefully sculpted and textured soft-touch materials and real wood grain make for a very nice cabin. You want comfort? 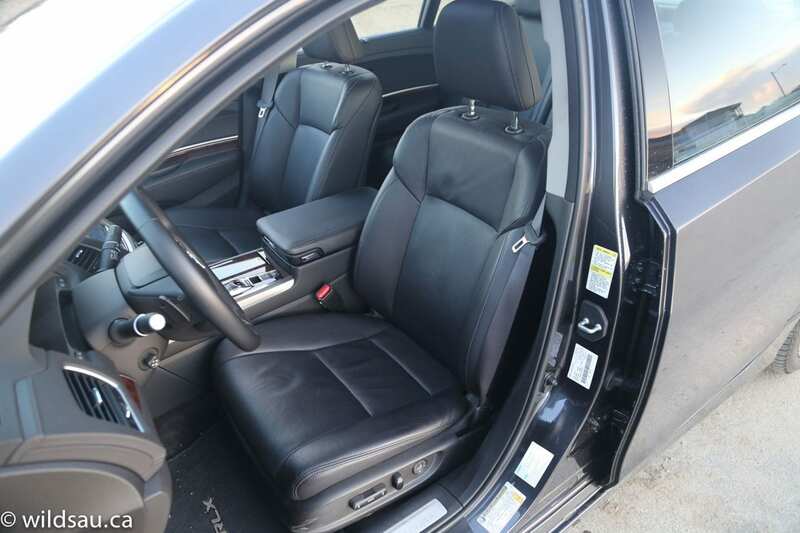 Touches like the power-adjustable heated steering wheel and incredibly comfortable heated and cooled infinitely-adjustable Milano leather seats see to it that you are treated regally. You want tech? Sometimes you get what you wish for and sometimes that’s not exactly a great thing. There are a couple of examples in the RLX. 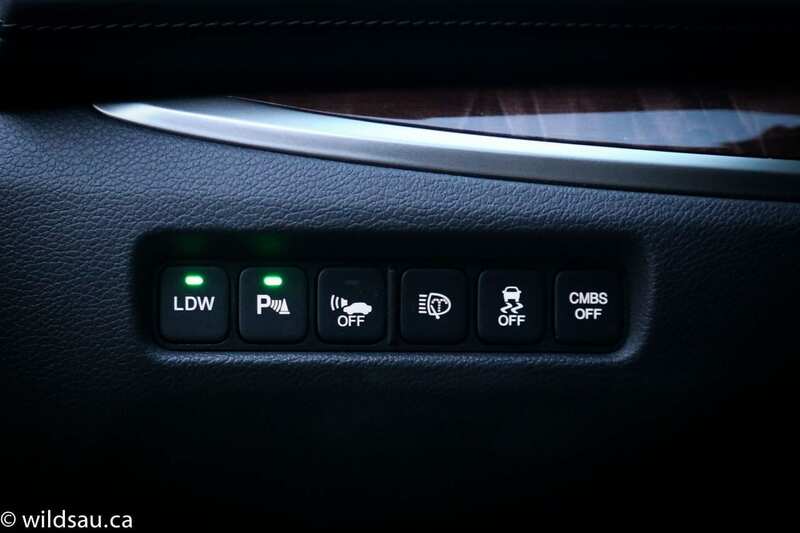 One is the new push-button, pull-thingie gear selector. Yes, it frees up the console from requiring a protruding lever, but the price you pay is a confusing combination of buttons and a tab you pull back for reverse. It’s not super-intuitive and you will learn to hate it in a parkade where a multi-point turn is required. It always felt like an answer to a question that was never asked. Give me the lever or give me … frustration. Next up is the two-screen system with an 8-inch main screen. Sure there’s an advanced navigation system and all the functions you could dream of, but the user interface of a touch screen, some hard buttons and an information screen just isn’t well thought-out and I found parts of it confusing from the minute I got into the vehicle until the minute it got picked up. 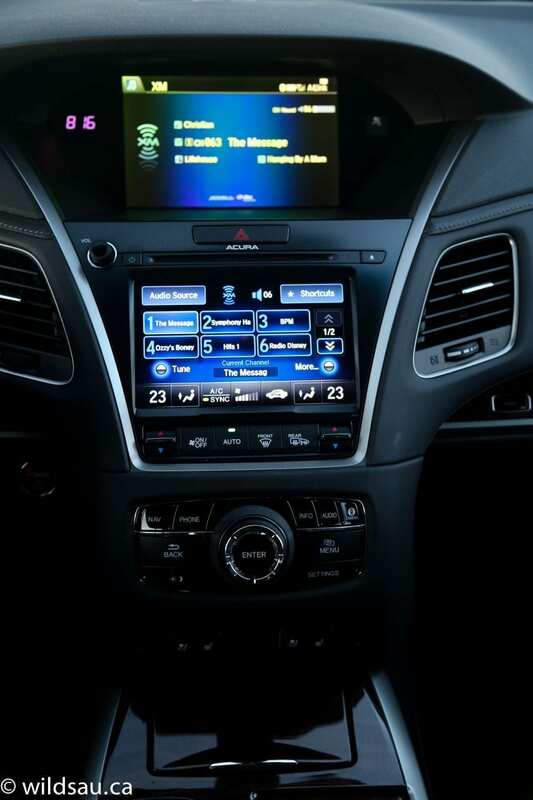 On the other hand, a ridiculous amount of driver assistance technology should work in concert to keep you and your passengers safe: you get forward collision warning, collision mitigation braking, lane departure warning, heads-up display and warning, blind-spot monitoring, lane keeping assist, adaptive cruise control with low-speed follow, a surround-view 360-degree camera system and parking sensors. Big fan of big sound? 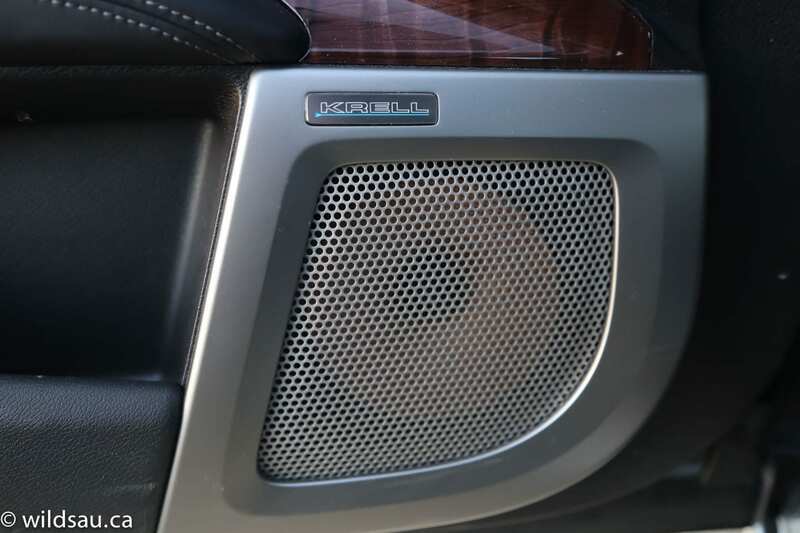 The RLX’s Krell premium audio system with 14 speakers is simply one of the best I’ve heard. It’s incredibly crisp, clear and powerful. Your passengers in the back will fell like royalty too. 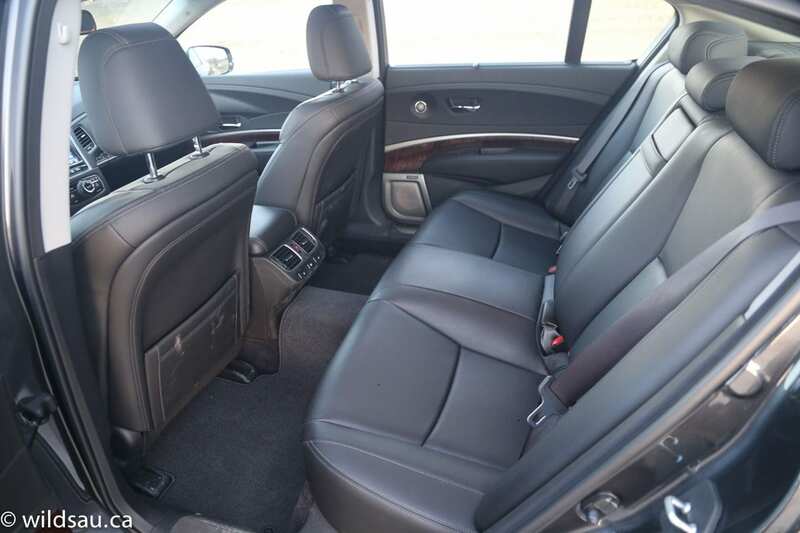 There’s plenty of space and you’ll have no shortage or head or leg room. The two outboard seats are insanely comfortable and heated and there are sweet little additions like a powered rear sunshade and rear door sunshades. It should go without saying that our three children were more than happy back there, with plenty of room. There are LATCH anchors for two child seats too. 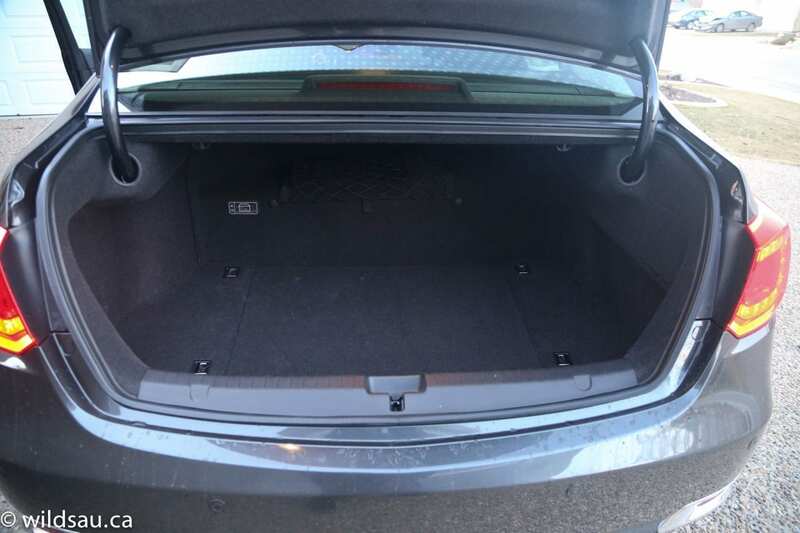 The hybrid system eats into the RLX’s cargo capacity, and the trunk, while not useless, is reduced to 328 litres. That capacity can’t be expanded – the rear seats don’t fold down and there is no pass-through like the gas-powered sedan has. So, let’s get this thing on the road! How does the Sport Hybrid, two terms that are usually at odds with each other, really perform? Let’s talk about what the car does right. Off the line, there’s plenty of pull. 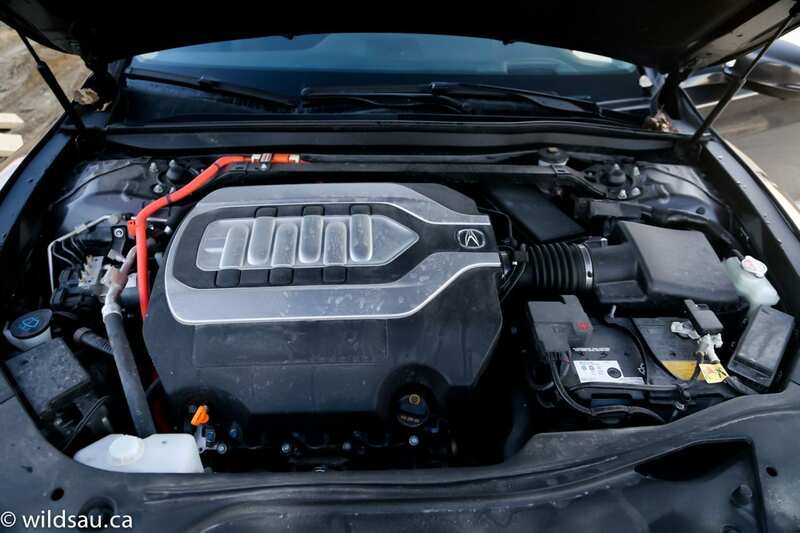 The engine definitely sounds like it’s working, but in concert with the electric motors, the RLX Sport Hybrid pulls nicely at all speeds – it takes off properly when you step on it, and passing on the highway is not an issue. 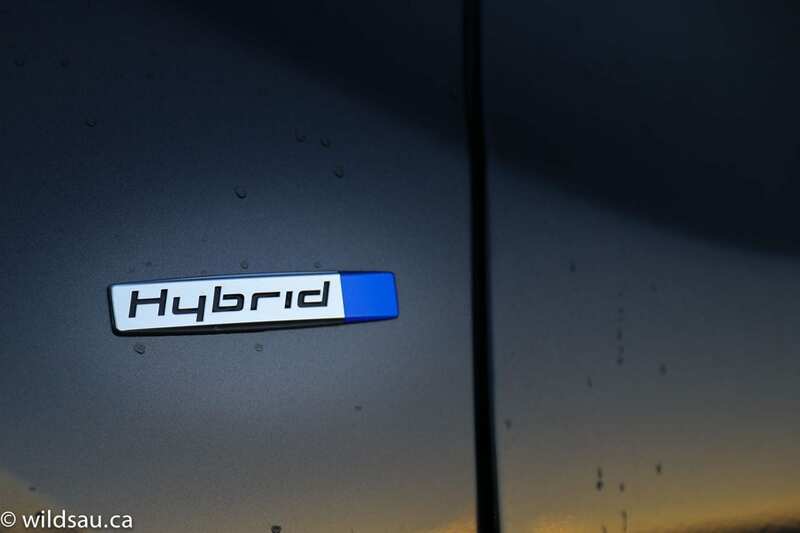 In hybrids, you expect mushier brakes that are working to bring your car to a stop while regenerating your forward momentum into energy to charge the battery. The RLX’s are mushy, but in terms of hybrids, I thought they were actually quite good, offering a bit of feel to the driver. OK, with that out of the way, it’s time to talk about the bad. Other hybrids make it difficult to tell when the gas engine starts and the system combines gas and electric power, you could almost always tell when that happened in the RLX Sport Hybrid thanks to the significant lurching and surging forward when the gas engine starts up and delivers its power to the mix. It drove me crazy, and never ceased to surprise me. It is a very unrefined sensation and not at all suitable for a vehicle that is supposedly the pinnacle of engineering for a manufacturer. The handling is an interesting mix. While it’s decent for a huge sedan, I felt that the car understeered and plowed more than the front-wheel drive gas-powered model. I felt that version was more composed and handled better with its 4-wheel steering than this one with its “Super-Handling” all-wheel drive. And there’s that ride. 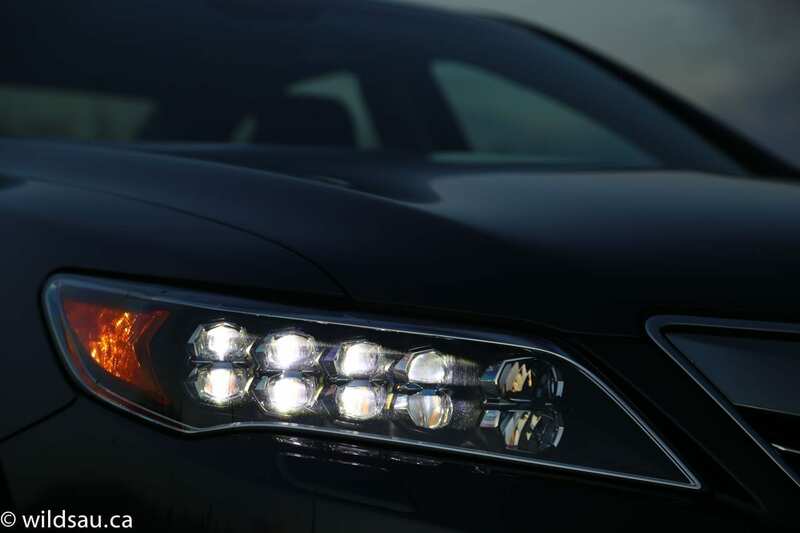 The RLX will surprise almost anyone with its terrible ride. From the get-go, it feels too firm for a big luxury sedan. On city streets, it feels a tad nervous and there’s hardly any of that isolating, luxurious damping that soaks up hits and protects you from the environment that you’re meant to float over. Not only that, it gets outright harsh over road irregularities, with any hits (big or small) coming right through to the cabin. And that’s simply inexcusable for a vehicle in this price range – especially one that is supposed to be running with the best. 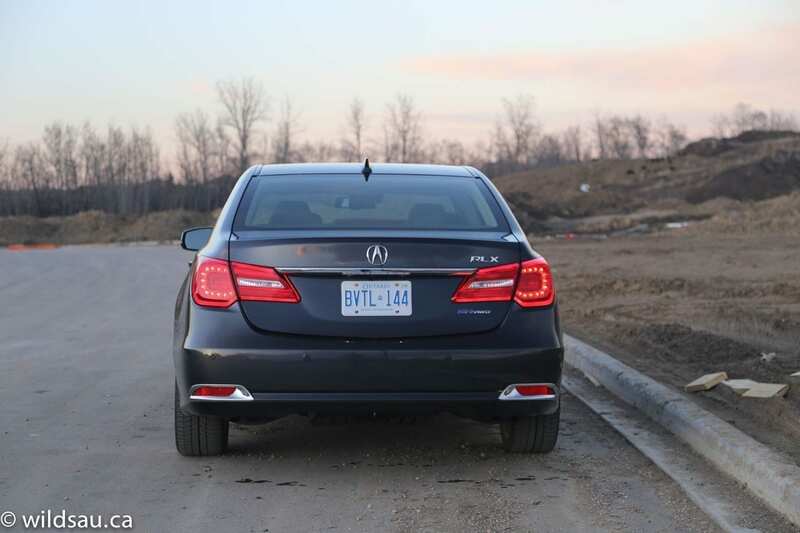 I do have to say that the RLX turned out to be fantastic on the highway – it runs quiet, it performs smoothly and the harsh ride evened out to become acceptable and it’s a powerful car. Oh, and the mileage? Well, we averaged 7.8 L/100 km (30 US mpg) during our week with it and that’s very impressive for a big, all-wheel drive 4365 pound (1980 kg) sedan. The good news for the RLX is that WAF (Wife Acceptance Factor) wasn’t bad. She felt it was a very luxurious car and that it looks expensive (if a bit boring). She also loved how much room our kids had in the back. But she complained bitterly about the ride, the silly push-button transmission and never stood a chance when it came to figuring out the two-screen ICE system. Oh RLX, I wanted to love you. I really did. I still cheer for Acura because it has a great history. Any company that builds something like the NSX gets a lot of credit from me. But the RLX is a car I could not love. Frankly, considering the price, I could barely bring myself to like it. Yes, the interior is very good (with the exception of some of the tech going overboard). Yes, the fuel economy is stellar for a vehicle of this size and with this kind of performance. But there is too much that feels like unfinished business in the engineering department. 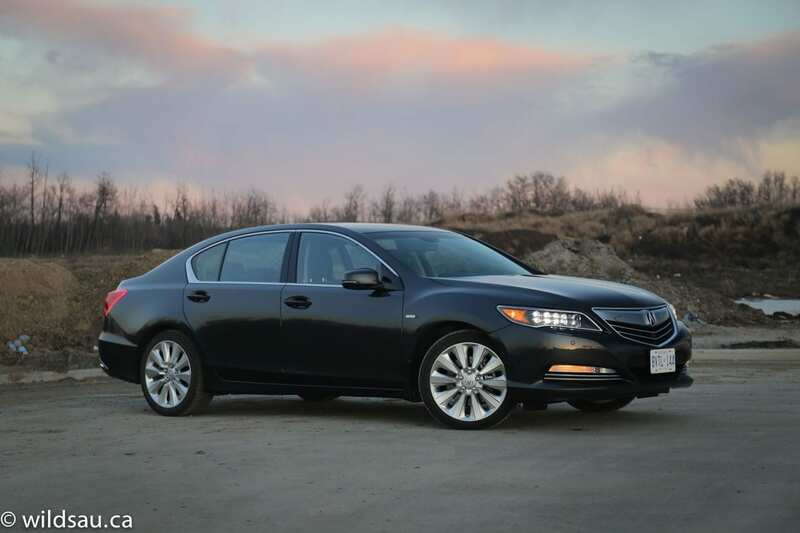 I am surprised that the drivetrain issues ever made it to production, and the same goes for the RLX’s ride quality. Sorry Acura, but the RLX needs a lot of work, and until some of these wrinkles are ironed out, I’d suggest you won’t be seeing a lot of these flying out of dealerships. The Sport Hybrid just amplifies this model’s issues because they’re even more noticeable at this price.